Imagine the last time that you felt stressed. Maybe it was this morning as you opened up your seemingly endless queue of emails demanding responses. Maybe it was last week when your boss asked you to take on a task that you hadn’t handled before. Maybe it’s right now as you consider what you need to do before you can go to bed tonight. Chances are that if you opened this post, you have more than one example you can think of, and you’re not alone. A huge proportion of people report daily stressors that have a negative impact on their lives. In fact, 75% of Australians report stress negatively affecting their physical health, and 64% said that it is detrimental to their mental health. With those daunting statistics in mind, it’s clear that we need meaningful, manageable strategies to reduce our daily stress levels. One way to do that is to get organised at work. Cutting the physical clutter has a way of reducing the mental clutter, and, in turn, reducing the overall amount of time that we have to spend worrying about our day-to-day tasks. In order to understand how personal organisation can help combat stress, we first need to explore what stress is and why we need to tackle it. Digging into that definition a little deeper, it’s important to note that not all stress is bad. Stress is a two-way process in Lazarus’ view. First, there are the conditions that the person perceives around them. Second, there is the assessment that the available personal and social resources are not going to be adequate to address that particular situation. Once that assessment has been made, stress occurs. Physiologically, stress has many outcomes on the body. There are biochemical responses when we have made the assessment that we are in over our heads and cannot adequately address the situation around us. Among these responses are a surge in cortisol and a contraction of blood vessels that increases blood pressure. This is a necessary condition. If we are, threatened, we need our bodies to respond with the infamous “fight or flight” response to survive. In these cases, stress occurs in a short burst, giving us the boost that we need to get out of harm’s way. Short-term bursts of stress give us the wherewithal to solve problems in innovative ways and to get stretched beyond our comfort zones, ultimately giving us the chance to learn new things and become better at handling similar situations in the future. In fact, stress can be good for you . . . as long as it is not chronic and you have some measure of control over how you handle it. Let’s go back to Lazarus’ definition. Let’s say that your boss has handed you a new task. You’ve never done this thing before, and it’s intimidating. You have assessed your situation and found your current skills within your typical comfort zone to be lacking. Your response is to feel stressed. You then use that stress as a catalyst to figure out solutions. It helps spark new ideas, and it motivates you to ask for assistance when you need it. Once you have successfully completed the task, you have built a new skill set to use the next time you are assigned something similar. This is the upside of stress. The downside is when the stress is chronic. You look around and you feel that you do not have the resources to handle the situation before you, but the situation isn’t a novel problem to be solved. The situation is that you have to figure out how to answer forty-five emails, complete a routine project, get on the highway before rush hour traffic, and get dinner on the table that night. You don’t need stress to help you come up with new solutions because the problem is not that you don’t know how to complete the task. The problem is not having the ability to put those skills into action because your attention is being pulled in too many directions at once. Time management guru David Allen explains in a podcast about productivity that our brains are not hard drives. We are not designed to store endless amounts of information. We’re very bad at keeping track of specific details and being able to recall them at the exact moment we need them. That’s not what our brains are wired to do, and it’s why we are so challenged by multitasking. Allen’s biggest piece of advice is to offload as much of the thinking we have to do in a day so that it is no longer weighing down our brain’s capacity. Make to-do lists, keep a calendar, and build systems that allow you to put what needs to be remembered outside of your brain. That gives your mind the space to do the tasks it really needs to do: think, create, innovate. Remember the Zeigarnik Effect and the Psychology of To Do Lists. This ties into personal organisation because having a work space that is well-ordered and easy to maintain offloads a lot of daily mental tasks. If the items that we need to complete a task are always in the same place, we never have to spend time remembering where we put them or trying to think of where they might be. If our books or files are neatly stacked on a shelf with the spines visible rather than haphazardly stored, we can always find what we’re looking for without taxing our limited resources. And you generally just feel better when things are organised around you. And personal organisation also brings us other benefits. Having a designated place for everything allows us to spend less time looking for things and maybe more time pursuing meaningful work or spending time with our friends and families. All of this leads to a more satisfying, more productive life. 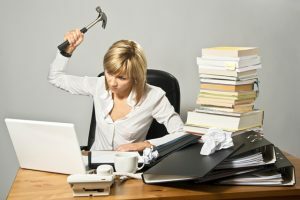 If daily stress at work is impacting your ability to think clearly and get work done, you can help yourself to get organised to reduce stress by implementing these five simple organisational strategies. Start small: Don’t try to organise everything in one day. Look around your office or even at home if you like; your desk at work, your car, your home office perhaps. Create a hub that stays organised and spread out from there. Starting small makes the task more manageable and more likely to last. Declutter before ordering: It can be tempting to head out immediately and find some shiny new tools that promise to be the silver bullet in getting more organised, but the truth is that getting more organised usually means getting rid of things first. Most of us keep too much unnecessary stuff! Think about it this way: the real benefit of organisation is prioritising what’s really important. That means getting rid of what isn’t important. You can apply the same principles here to your Email Inbox also. Get rid of all your old emails first. Create a new Email Folder and call it “Old Emails” and drag all your old/redundant emails into this folder. You can can sort through it and file them away properly at another time. Once there out of your Inbox though, you are not continually looking at them. Out of sight – out of mind! Simplify routines: Find out where you are spending the most mental energy. Is it taking a long time to decide what to wear in the morning? Perhaps your wardrobe is a place to organise and simplify first. Do you spend too much time trying to figure what to do when you first sit down at your desk? Are you constantly scrambling between tabs on the computer because you have so many open at once? Tackle these stressors by setting up routines. Add one new routine into your daily habits at a time and get comfortable with that one before adding another. Eliminate piles: Anything you have to sift through is taking away your time and mental energy. 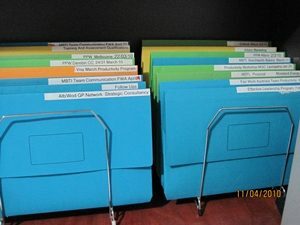 At work, store your paperwork vertically in file folders instead of in piles on your desk. Create a colour-coded system to make things easily identifiable. This further reduces the strain of finding what you need. Clean up your Email Inbox: So many people have Inboxes that are literally out of control. Try clearing out your Inbox of all your old emails you have already dealt with. File them away in Email Sub-Folders. (Refer point 2 above) From now on, you should manage your Inbox using the 4D strategy. Once you have dealt with an email, be sure to file it away. (Deposit) Don’t let emails build up in your Inbox again! Once you recognise stress for what it truly is—a message to your body that something needs to change—it’s easier to think about tackling it in a systematic way. If what needs changing is your everyday surroundings, the best way to get them under control is to reorganise them to improve your productivity. In short, ;get organised to reduce stress. Need a hand reducing stress and getting more organised at work? Contact Lingford Consulting about our range of productivity training programs that will help boost your personal productivity and help you get more organised at work.